Broccoli is of the Brassica oleracea species. It is often called a brassica or cruciferous vegetable from the Brassicaceae or Cruciferae family. Mostly annuals, but some varieties can be made to grow as perennials. Famed for its health benefits, broccoli's nutritional qualities include cancer fighting phytonutrients, such as sulforaphane, and flavonoids, such as quercetin. It's a rich source of vitamin A, C, calcium, lutein (for eye health) and zeaxanthin. Broccoli will tolerate frosts of 20°F (6.5°C) and likes daytime temperatures around 50-70F° F (10-20°C) and certainly no higher than 80°F (26°C), or it will bolt to seed. Certain varieties of broccoli are better for warmer areas than others, so check what grows locally or ask at the nearest plant shop for the ideal plants for your garden. Basically, no matter when or how you grow broccoli, there's no getting around the fact that when it matures in the chillier months, it simply tastes the sweetest. Depending on your climate, sow seeds early to mid summer, which will take 4-6 weeks before ready for transplanting, or plant seedlings out no later than late summer. Broccoli needs to develop a good size with strong leaf growth before the cool weather sets in. If you get your broccoli growing early enough without suffering excessive heat, it will be ready for use in late autumn and winter. That's one way to grow broccoli, but you can also plant seedlings mid winter to early autumn and get a crop to pick before the high summer temperatures arrive. Ensure the winter sun reaches them for 4 or more hours a day. You will not need many plants as each plant will produce continuously over time, but do consider successive plantings as you don't want it all to mature at the same time. Even better is to grow different varieties so they mature at different times. As a rough guide, 8-10 plants are enough for the average family over a season. Allow 3-4 weeks between plantings to space the harvest over time. Broccoli seeds will take 11 to 15 weeks, but sometimes up to 20 weeks. Broccoli seedlings will take 8 to 12 weeks from transplant until harvest time, depending on the variety. It's better to sow your broccoli seeds in punnets or trays first and transplant later. Why? Because the seeds are small and round, so tend to roll away to lostville if you're trying to put them in the ground! Tiny new seedlings are gourmet breakfasts for slugs and snails, so get them established first where you can keep an eye on them before sending them out to the big bad world. Prick out the less hardy plants as the broccoli seeds sprout. In about 5 weeks, once they are 7-10cm high (3-4"), or have at least 4 main or true developed leaves, they can be planted into your garden bed. Seedlings should be placed at least 45cm (18") apart for most varieties, and with the dwarf varieties, space 30cm (1ft) apart. Water well and don't let plants dry out completely from now on. Although broccoli like to have uninterrupted growing with no prolonged dry spells, they also dislike their roots in bad drainage, so if necessary, have your broccoli growing in wide mounds. They love lots of organic compost added the soil, and don't mind if it's even partially composted beforehand. Compost made with animal manure or some well rotted chicken manure gives good levels of nitrogen which broccoli need. Broccoli is a leafy green plant so growing it fast in fertile soil is a must. To really keep broccoli growing well and producing like a champ, particularly once the first signs of florets form, regular top ups every 3 or so weeks of organic fertiliser is appreciated... remember it's hungry and in a hurry. Compost tea, especially made with added chicken manure is excellent for growing broccoli. If you can get alfalfa meal, this is another useful nitrogenous fertiliser. When growing broccoli, put down a layer of mulch such as straw, leaves etc, or a couple of inches (5cm) of grass clippings. This will help keep the soil cool and moist which broccoli prefer. Broccoli varieties are more about producing florets, sometimes making up a large head, sometimes more individual loose florets. On the other hand, cauliflower varieites form single large heads. Debates rage over whether certain plants are cauliflower, broccolini, or broccoli varieties. What's called something in one country is called another somewhere else. Holi moli broccoli! These are the popular garden broccolis, big heads of dark grey-green, tightly clustered florets. Easily produce smaller side florets after main head has been cut off. There are green and purple sprouting varieties. These are loose bushy types and can be picked for long periods. They prefer milder winters than other varieties. A large and beautiful broccoli variety, with an apple-green spiral head made up of smaller spirals. It's more like a cauliflower, but slightly looser and with a pointed head. Particularly tasty. This is an old Italian variety which has immature flower buds on loose leafy stalks. A fast growing broccoli and spicy flavoured. Great for Italian and Asian stir frys. 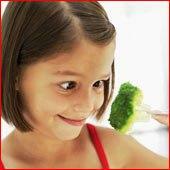 Now you know all about growing broccoli, what about harvesting, eating and storing it? Although it is from the same family as the cabbage, broccoli is grown for its edible, immature flower heads. Broccoli love having their heads cut off... they will grow more heads for you — little bitty tasty ones. When the central main heads are still compact and darkish, which is usually up to 25cm (10") wide... off with their heads about 12-20cm (5-8") down the stem and just above where some main leaves join the stem. You really only have less than a week of optimum opportunity to do this first broccoli harvest. If you leave slicing off the heads too late, that is when the florets loosen and there are signs of yellow flowers forming, they will be coarser with a strong, but not such a nice flavour to eat. An exception is the sprouting broccoli whereby the florets are looser and sometimes have a few yellow flowers just beginning to open. Always cut the heads and florets off the stem with a sharp knife and on an angle so rainwater cannot collect and rot the remaining stem. Leave the stems with the remaining leaves on, continue to water and new florets will sprout out from the leaf axils. Keep cutting these sweet delicacies off to eat and the plants will keep producing, often up to 2 more months. Pick the tender leaves and also the flowers when they come, these are all edible and full of goodness. Growing Broccoli — then eating it! Garden-fresh broccoli is sweet and tender and is excellent eaten raw. Cut into bite sized pieces and throw into salads. Marinating for an hour or two in fridge with an equal mix of raw apple cider vinegar, lemon juice and olive oil is nice. Try balsamic vinegar sprinkled over raw or cooked broccoli too. If you want your broccoli slightly softer, maybe for dips or salad, pour boiling water over cut pieces and leave for 2 minutes, then rinse with cold water. For cooking, steam for 4-5 minutes or before it goes mushy. For tougher broccoli, peel the stems if they are too chewy. What if your broccoli has gone to flower? Whether it's an early season mistake, or it's the end of the season... the flowers you don't need for seeds... eat 'em. Let the flowers open and they are edible, in salads, with fish, and their petals sprinkled like confetti over pasta and other dishes. How to store broccoli: To store fresh broccoli, put in veggie crisper in fridge or seal in plastic bag and keep in fridge. It tends to loose its crispness and freshness in the refrigerator after about 5 days, but will keep for up to 2 weeks. Freezing: If you have gone overboard with growing broccoli and end up with more than you can use; cut them it into bite sized florets and pieces of peeled stem and blanch them in boiling water for 3 minutes. Plunge into cold water — ice cold if possible, then freeze it for use later. Best used within 6 months. See more at freeze vegetables. Definitely don't miss Extra Tips on How to Grow Broccoli for indispensible pearls of wisdom for broccoli growing success. List of Vegetables: Lots more vegetables to grow.